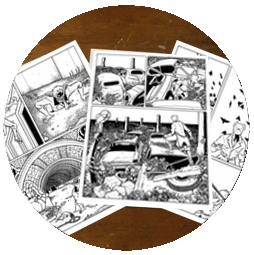 The long-awaited collection of the first online Cochlea & Eustachia story arc in glorious full color! Also includes a never-before-seen bonus story! Perplexing, indescribable compendium of short comics and oddities originally featured in Chrome Fetus and innumerable anthologies! Enigmatic graphic novel following the travails of two eccentric brothers who build musical instruments from animal carcasses in a stodgy 19th-century New England town. Xeric Award Winning debut graphic novel about a lonely adolescent girl who falls in love with a hermit dwarf.